Kids were playing with their food, and Nick Adjami ’17 couldn’t be happier. It was, after all, part of the William & Mary student’s job this summer to get kids interested in vegetables, and on a recent morning at the Williamsburg Farmers Market that meant giving them the chance to race derby cars made from squashes and carrots. “Not only was this one of the kids’ favorite activities, it also got them excited to go home and eat squash, something they might not otherwise do,” he said. 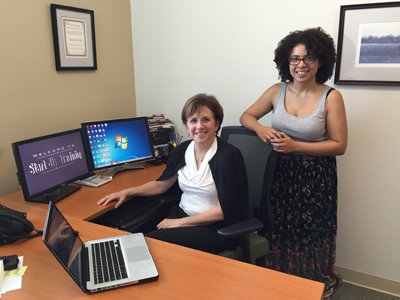 Adjami’s internship was one of three that were funded for the first time this summer through the Office of Community Engagement (OCE) at William & Mary. In addition to Adjami’s internship with the Power of Produce Club at the Williamsburg Farmers Market, Ashleigh Arrington ’17 worked with Literacy for Life and Jen Hartley ’17 with the Arc of Greater Williamsburg. Although the Office of Community Engagement has awarded summer service grants to students for several years, the office wanted to go one step further this summer. “In the past year, we've been talking to local partners about their need not only for direct service but also for projects which increase their capacity, like program management, volunteer recruitment and outreach,” said Elizabeth Miller, assistant director of the Office of Community Engagement. Hartley, a public policy major, has been involved with The Arc since her freshman year at William & Mary through her participation in Greek life at the university. The Arc provides activities and advocacy for people with developmental disabilities. 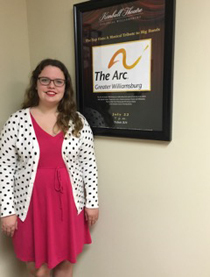 “By the time this opportunity to intern at The Arc came up, I already knew how much I loved being a part of The Arc family, so I jumped at the chance to spend my summer with them,” she said. Beginning June 6, she worked as a development intern with the organization, helping with fundraising, grants, programming and planning for events, such as the upcoming 7th Annual 5k Benefit Run. In the spring, Hartley took an American studies class titled “Disability in America,” which has been very relevant to her work with The Arc, she said. Her internship has been similarly enlightening, she added, saying that she’s learned how unique and important The Arc’s services are. Pam McGregor, executive director of the organization, worked closely with Hartley throughout the summer and said that she demonstrated maturity, insight, and initiative. “Her skill-set and ‘can do’ spirit helped us accomplish many projects this summer,” said McGregor. “A successful benefit concert, an improved website, updated formats for spreadsheets and data entry, as well as the creation of marketing materials for our upcoming 5k, made her an invaluable part of our team this summer. We will miss her very much but wish her nothing but success in her senior year." As the internship draws to a close this week, Hartley knows that she will leave the position with a greater appreciation for all involved in the operation of a non-profit. “I have always been amazed with how much The Arc has been able to do on a day-to-day basis, and the organization's accomplishments seem even more incredible when considering how much time the staff must spend on securing the future,” she said. Arrington, a double major in sociology and gender, sexuality and women’s studies, began her internship with Literacy for Life, which teaches literacy skills to adults, on June 6. Arrington has spent much of the internship working on creating a training video for potential tutors so they may be able to watch it on their own time instead of attending all three of the organization’s mandatory, three-hour orientation sessions for volunteers. 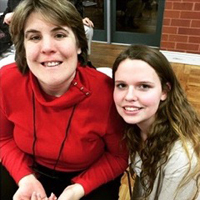 “Ashleigh was able to tackle a project that was very much needed, but that our staff did not have the expertise or time to do,” said Fiona Van Gheem, program operations manager for Literacy for Life. “She listened carefully to what we were looking for and then worked independently while providing timely updates. She used her initiative and was able to develop new skills which will help her in the future. We are extremely pleased with the multimedia training that Ashleigh was able to produce and thank her for her hard work. We already have potential tutors ready to make use of this online training. Arrington said that the internship has taught her just how much of a difference education and literacy can make in a person’s life. Arrington has also discovered that the Williamsburg community is broader and more connected than she had previously thought, noting the area’s high demand for English as a Second Language and English language instruction. Adjami, a sociology major, will finish up his internship as the Power of Produce Club coordinator on Sept. 3. The club, launched in Oregon in 2011, is a national initiative that strives to empower children to make healthy food choices. Adjami, a former arts camp counselor, said that “the opportunity to combat a social issue by educating and inspiring children” is what drew him to the internship. Since this was the club’s first year in Williamsburg, Adjami, whose internship involved both office work and hands-on activities with the program on Saturdays, didn’t have any previous plans to follow. Although that task can be difficult, Tracy Herner, market manager, said that Adjami has done an outstanding job. An environmental sociology class that Adjami took during his sophomore year introduced him to the issue of food justice (and inspired him to become a sociology major), he said. The internship showed him how that issue affects the Williamsburg community.